If I had to pick one thing on my boat that always causes me grief, my answer would require no thought. Whilst there are a handful of usual suspects to choose from, my Eberspacher heater (�affectionately� named Schnebby) is the one thing that, without fail, has given me issues every winter. But times are changing. Whilst the earlier failures were due to the parts within Schnebby himself (yes, he�s personified; it increases the range of profanities I�m able to direct towards him), last year�s new glow plug has cured his little quirks and he has been running smoothly for over a year now - a miracle. However, there�s a bit of a caveat. 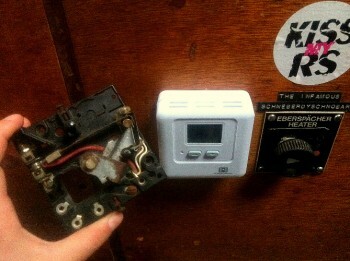 Whilst Schnebby works fine, the thermostat switch that controls his two speeds is completely broken. But, for over four years, I have plodded on, and learnt to live with the fact that the thermostat doesn�t actually work. I usually have to get the long pointy chart dividers out every time I want to poke about inside it and change the heat setting from high to low, or vice versa. And that never works properly, so Schnebby goes into a mood and stops working, and I have to turn it off and on, and still can�t get the damn thermostat to switch. Harrrrumph. The other week, my mum and dad came down to visit. It was very cold. I had been trying to switch Schnebby onto the hottest setting, and my prodding and poking inside the thermostat had really messed it up. I couldn�t get him to work at all now. Then, I had an idea. Why not buy a new thermostat? Well? Why not? What�s my excuse? What reason do I have for putting up with a stupid, broken thermostat that screws up my finally-fixed Schnebby? No reason. No excuse. It�s just one of those things you seem to learn to live with on a boat. Similarly, the galley sink drains into the grey water tank. Every year or two, the grease clogs up the float switch so it stops pumping out and ends up flooding into the bilge. Yuck. I should re-route the galley sink drain, but instead, I spend a few hours in the bilge every 18 months. Occasionally the hatches leak, with the right combination of wind direction, speed, and precipitation. Instead of fixing them, I actually resorted to buying a pack of nappies to duct-tape underneath when the need arises (usually at 3am when it�s blowing a gale outside and I�m awoken to Chinese water torture). My gas clicker lighter for the cooker ran out, and I left my box of matches on a friend�s boat. I should simply replace either one of them, but instead, I burn the little hairs on my fingers every time I light the cooker with a normal lighter. I don�t keep all of my clothes in the forepeak because it gets a bit damp. I should buy storage boxes, but instead, I have learnt to live with a pile of clothes on the bunk in the mid-cabin. But it�s not all doom and gloom. Schnebby has a new thermostat. It works perfectly. It has actually changed my life. I just want to know why it took me four years to get round to it.